Vice Mayor Rex Richardson speaks to “Fight for $15” advocates outside city hall before an August 2015 meeting, where the council voted to approve a minimum wage study. Photo by Jason Ruiz. 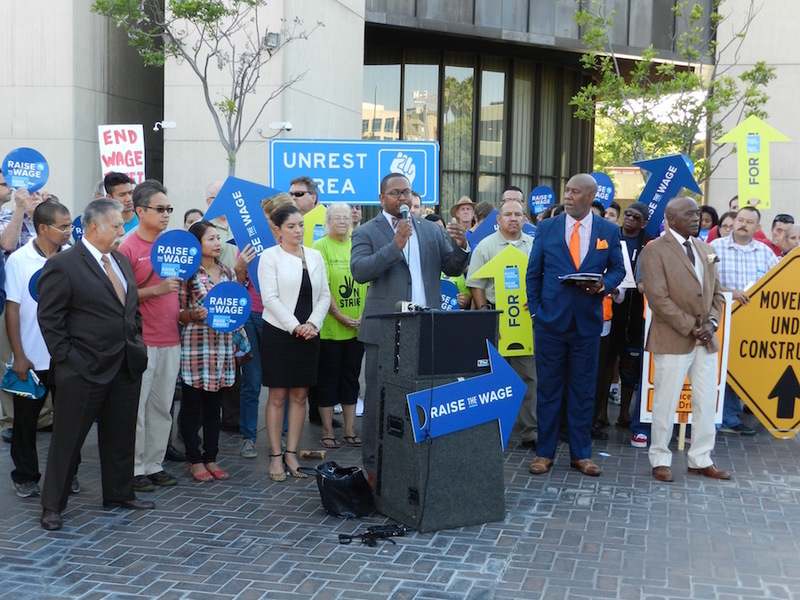 When it comes to the city’s minimum wage ordinance it turns out the “Long Beach Way” will look very much like the State of California’s way, after a unanimous vote by the city council last night to align the city’s wage raise schedule with the bill signed into law by the governor earlier this year. The vote will slow the city’s originally approved wage schedule, which would’ve seen its minimum wage rise to $13 by 2019, one year ahead of the state’s schedule and provide an additional year for small businesses in the city to comply with the wage hikes. It also eliminates a provision in the original ordinance that called for a study in 2019, which would’ve assessed if the city could afford to continue down the path to $15 an hour, as not raising the ages past the $13 mark would’ve eventually put the city at odds with state law. Senate Bill 3 was signed into law by Governor Jerry Brown in April and it largely resembled the Long Beach plan approved in January. However, the Long Beach plan aimed to reach the $15 an hour mark in 2021 while the state’s model reaches that point in 2022. This was a central argument for business leaders as well as employees in the city: how fast could the business community accelerate toward that figure, and conversely, how much longer could workers wait? Jeremy Harris, senior vice president of the Long Beach Area Chamber of Commerce, asked the council to consider the wage hike that took effect at the beginning of this year, the looming rise in minimum wage already scheduled for January 1, 2017 and the impacts that the recently increased sales tax and potential countywide tax increase could have on Long Beach business’ ability to compete regionally. Putting the city on the same track as the state will mean little for next year’s increase, as both were scheduled to bump up their minimum wage to $10.50 an hour on January 1, 2017. However, the increase in 2018 will now be to $11 instead of $12 and increase by one dollar every year until 2022 for large and medium businesses. For small businesses (25 employees and under) that raise schedule wont begin until January 2018. Other changes that were adopted with the state’s plan were the use of the state’s consumer price index to dictate future wage increases after the $15 mark is reached in 2023, and the amount of time employees are able to be paid a “learner’s wage.” Under the city’s proposed plan, this time window was 480 hours at 85 percent of the actual minimum wage. The state’s plan only allows for the first 160 hours of work to be compensated at 85 percent of the wage. The community groups that had helped lead the charge for the “Fight for $15” again turned out to the council’s deliberation to voice their concerns that pushing the wage schedule back was only harming those in the community who needed the raise the most. Despite losing that lobbying effort to have the council stick with the Long Beach schedule, they did score a victory in First District councilwoman’s revision that included the allocation of hundreds of thousands of dollars for wage theft educational outreach and funding for local wage theft investigators. Gonzalez’s amendment adds to the city’s already allocated $425,000 for educational outreach by asking that funding be dedicated for the investigators. The sum was estimated to push the total over $700,000 by city staff and would most likely be an annual expenditure. Because the budget has yet to be finalized, the council was advised it would have one week to find an offset or a funding source for the expense. The wage theft component drew mixed responses from the community, which by-and-large supported the initiative to have local enforcement, and from Third District Councilwoman Suzie Price, who in a self-prepared PowerPoint presentation outlined potential pitfalls for the city in trying to enforce the law locally. She also noted the city might not have the legal ability to even do so. She compared the city’s efforts to public works trying to do street work on Pacific Coast Highway (PCH), which is under the jurisdiction of CalTrans, because it’s a state highway and subject to state maintenance. The money spent on local enforcement, she said, could go toward other needs in the city, like increasing the city’s police force. Steve Askin, a financial analyst and frequent voice in the minimum wage discussions that have spanned over a year, pointed to a recent UCLA study that showed less than 20 percent of workers who file wage theft claims in Los Angeles County actually see them completed, and fewer than one percent of those actually achieve redress. He urged the council to adopt the amendment for strong local wage theft enforcement not only to help the workers who are victimized by their employers, but also to help the business community that is hurt by having to compete with those types of employers.